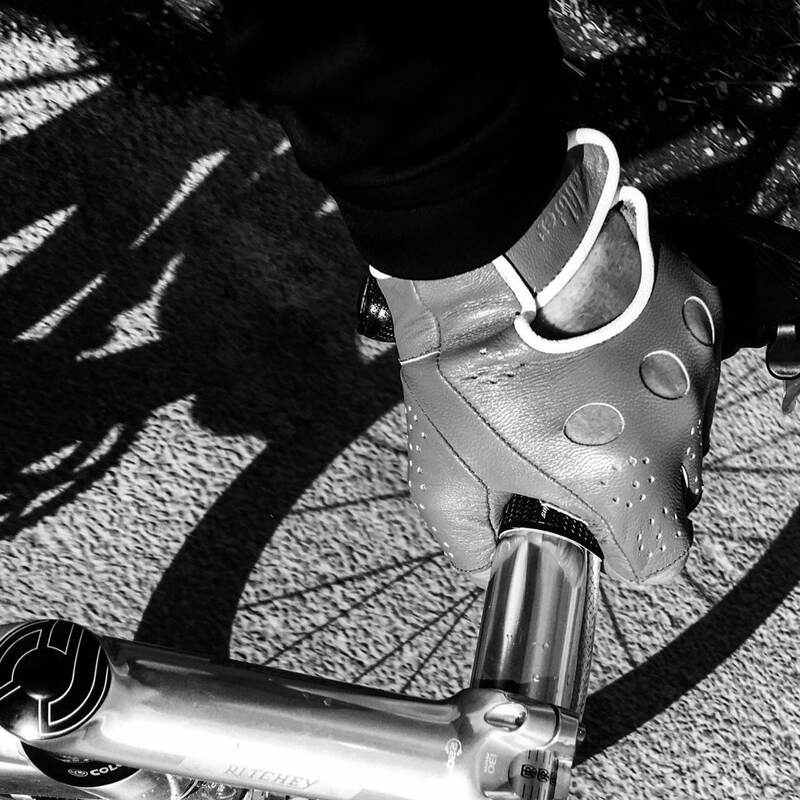 A hand stitched, natural leather cycling glove which will mould you to your hand. 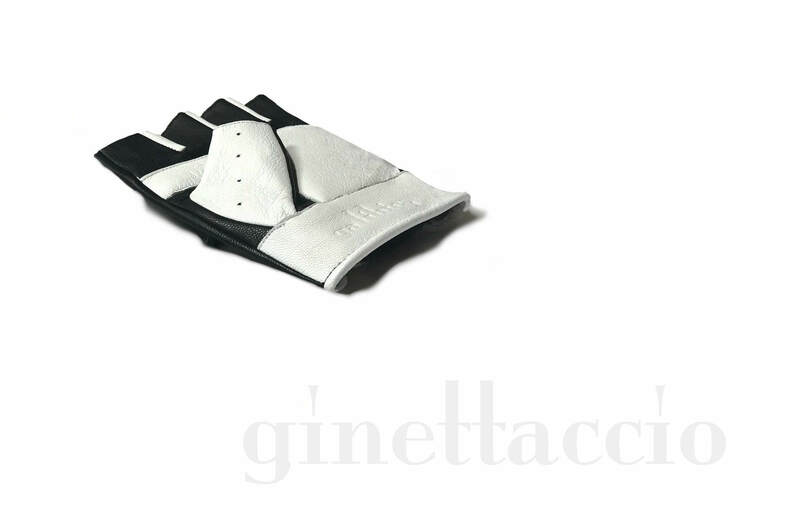 The Ginettaccio glove embraces both traditional imagery, contemporary design and natural leathers. There are times when we look to technology for solutions. Regardless of how many glove designs we tried, we kept returning to an all leather glove for long term comfort and protection. Just two rides and these will match your body, as the natural materials take the form of your hand. 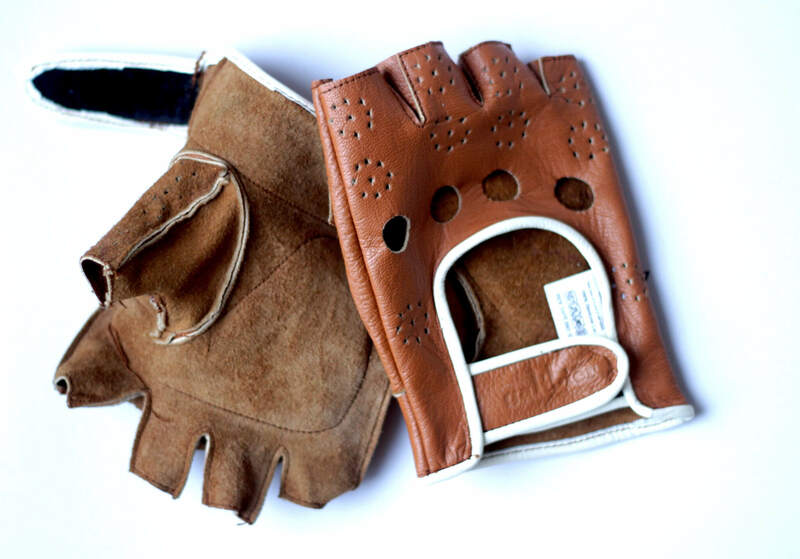 The gloves are breathable and the goatskin (more subtle than cowhide) wicks sweat extremely effectively. Good mitts are worth their weight in gold and we have worked hard to offer a premium, hand-made, all leather mitt, at the price of a synthetic glove. These are FULLY hand cut and sewn so will have small differences (character) from something robot made. The palm is lightly padded by adding an extra layer of leather and have perforations on the fingers and knuckle holes to assist with ventilation. The gloves are naturally dyed Cognac leather with a cream trim. Goatskin is often referred to as nature’s strongest leather. It has very high tensile-strength and abrasion-resistant properties, but has excellent softness and is lightweight. 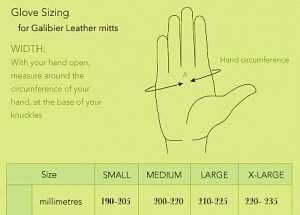 The leather will bond and stretch to your hand after a few rides, so should feel tight and snug around the fingers when first put on. Once matched they will be your new favourite thing. 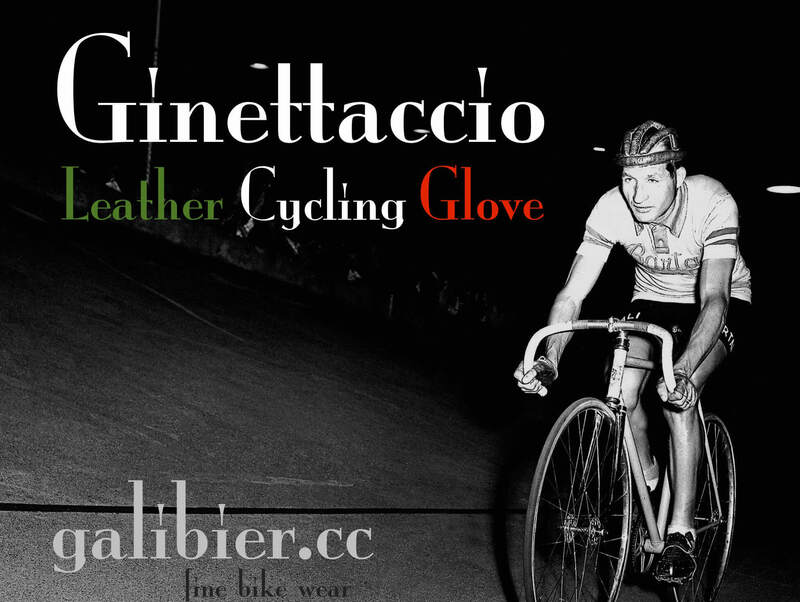 Ginettaccio, is a honourable name awarded to a champion road cyclist. 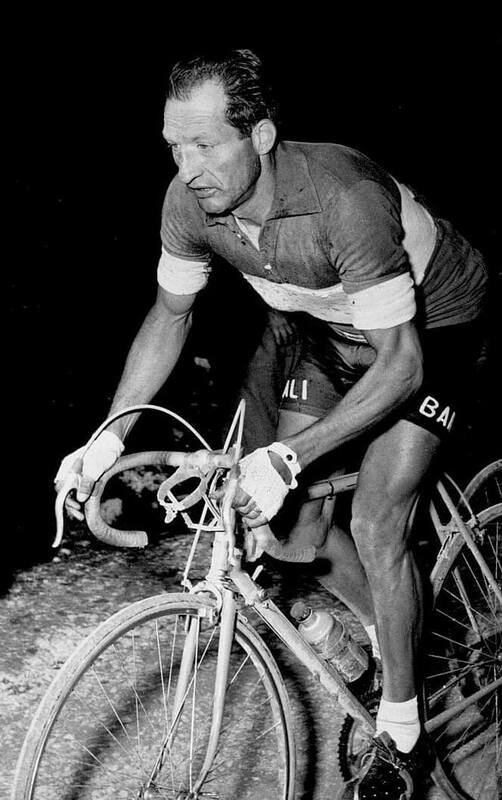 Gino Bartali the powerfully legend is more commonly lauded with the title. With a broad nose and a boxer’s face, he began work in a bicycle shop when he was 13 and began racing the same year. Our beautifully made mitts are made in honour of the attrition and style of Bartali. The promising amateur and turned professional in 1935 when he was 21. He was Italian champion the next year earning the nickname Ginettaccio. The most renowned Italian cyclist before the war having won the Giro d’Italia three times (1936, 1937, 1946) and the Tour de France in 1938. His second Tour victory came in 1948 gave him superhero status, as it was the largest gap between victories in the race. Like all good mitts, they should be neat fitting. NB> DIFFERENT SIZE FITTING TO OUR OTHER GLOVES. Measure right around your knuckle and compare to chart below. A good fitting mitt should be pulled off one finger at a time. Sweat will eventually eat away at the leather without any care, so it is important to regularly clean the gloves and apply glove balm to maintain the integrity of the leather. Thanks for the quick size swap Galibier. My bad for not using the size chart. Love the quality and feel. Italy here I come! Only took one ride to break in and feel lovely. Would advise to size down from usual glove size as they will stretch. Don’t know how you do it for £22. Stitching not exact (I know you did say hand made) so a good 4 stars. Beautiful leather and well made. Cut for square hands, I got small (I got large in winter gloves and they are tight). Roomy around knuckle but a bit short in the cuff. worn first time on 55 mile ride. Forgot I was wearing gloves they were that comfortable, have adapted to the shape of my hands after one ride. Medium is my size and these in medium are a good fit. 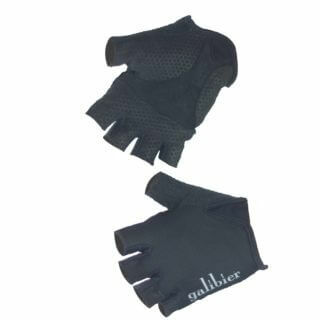 Another quality item at a great price from Galibier. Why buy anywhere else. Purchased these a few months ago now and have worn them on numerous occasions. They fit well, are comfortable and stand out from the crowd. Which has attracted favourable comments. Ordered on Monday, arrived on Wednesday and wore the same evening! The gloves are a lot more comfortable than you might expect them to be. I normally buy XL so did for these too, but would probably size down to a Large if I buy another pair (which is more than possible). 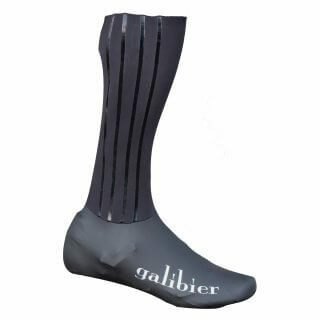 Great product and service does not disappoint either, I can’t find enough good things to say about Galibier, this is the 4th time I’ve bought from them and it won’t be the last, very, very well designed and made products. I bought these because I am a Gino Bartali fan…along with a white leather pair. They are my glove of choice for general riding. 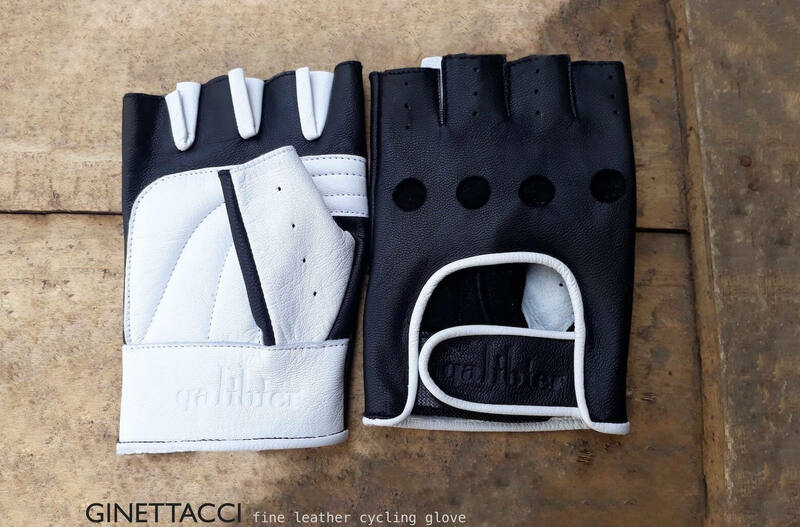 While many of us old enoguh are happy to foget the older real chamois padding and atrocious materials, leather mitts, or these Galibier ones prove there were some things they got right back then. I have relegated my many synthetic mitts to the back of the pile, perhaps i need a pair of Galibier winter gloves….but we only every get perhaps two weeks of cold weather here ever. Great hand made product, at great price. Fit well true to sizing in description, and look special. Had to replace first pair as there was problem with stitching on velcro cuff – super fast turn around, thank you!